Casa Tecla is a small villa by the sea in Santa Tecla, a characteristic village on the east coast of Sicily, just a few kilometres away from Acireale. 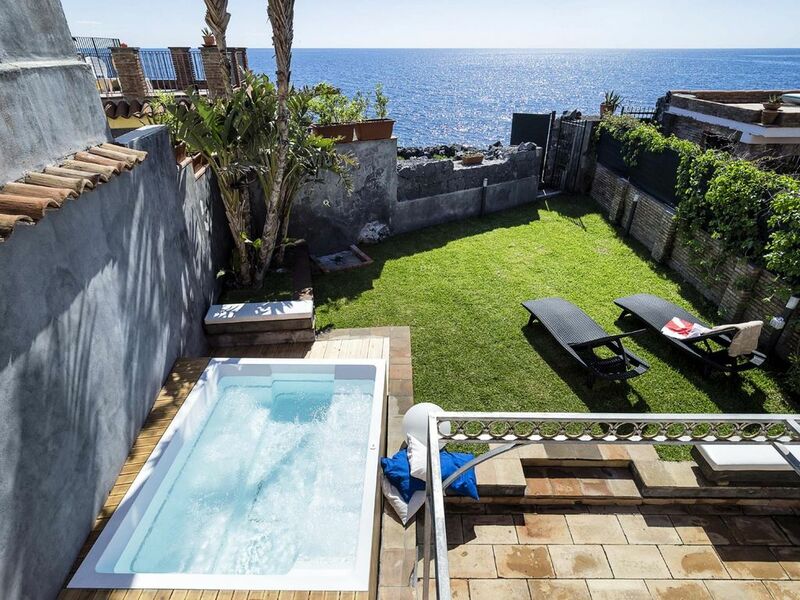 The property enjoys a splendid seafront position and boasts an equipped terrace, a garden with a Jacuzzi and a private access to the rocks and sea. Spread over two floors, the cosy interiors are furnished with taste and are equipped with air/conditioning, internet Wi-Fi, satellite TV, washing machine, dishwasher, bbq and external shower. On the ground floor the living area includes a sitting room open onto the dining room, a kitchen and a bathroom. The first floor houses the sleeping area with two bedrooms and a further bathroom. Casa Tecla is also a great base for visiting some of Sicily’s most beautiful places such as Acireale, the Cyclops Riviera, the Mount Etna, the Alcantara Gorges, Taormina, Catania and Syracuse. G.F.: entrance, living/dining room, kitchen, 1 bathroom with shower, laundry room, terrace, small garden, whirlpool tub; 1st F. (with sloping ceilings): 1 double bedroom, 1 double/twin bedroom, 1 bathroom with shower. Services included: final cleaning, bed linen and towels, water and gas consumptions. Extra services (to pay on the spot): safety deposit euro 300 in cash, air conditioning, heating.